1ST BDE - Darting in every direction just above the tree tops, an unusual helicopter is being used to supply the 25th Inf Div with tactical information on Viet Cong locations and movements. The unusual chopper now in use by the 3rd Sqdn, 17th Air Cav, supporting the 25th Div, is the OH-64 Cayuse light observation helicopter. The Cayuse is tailor-made for aerial reconnaissance. The light weight scout ship carries a three man crew - the pilot, an observer and one door gunner. Each has a separate job, but all three must work as a cohesive team since their ship flies within range of enemy small arms fire. MAJ Jerry Leadabrand of Greenwood. Neb., Commander of Trp C, 3rd Sqdn. 17th Air Cav, explained the mission of the Cayuse and its crew: "This is strictly an observation helicopter and its mission is just that, reconnaissance of land areas to observe and report enemy positions and movement." "Although the Cayuse was not built to be a war-rager it does have somewhat of a ferocious look about it when you see the six-barreled mini-gun it carries for self-defense. The mini-gun can fire up to 2,000 rounds per minute, related SGT David Scott, a 22-year-old observer from Max Meadows, Va.
As the Cayuse crews fly their dangerous mission just above the ground they are never alone. On every mission by the small scout ship, a fast and sleek Huey gunship circles overhead to supply protection if the little chopper draws ground fire. If the Cayuse draws fire the crew drops a smoke grenade and clears the area. Then the hovering gunship crews sweeps down firing rockets and miniguns. As a safety precaution, the scout ship has duel controls; in case the pilot is hit the observer can fly the ship back. The observers are usually not trained pilots, but each pilot attempts to give his observer training so if the occasion does arise, the observer can bring the ship home. The Cayuse crews direct air strikes and make damage assessments after bomb runs. All sightings by the Cayuse are radioed to the guship for transmission back to the troop's headquarters. When infantry units begin operations in a new location, they know what their new geographic area consists of and what size enemy force to expect, thanks to the information from the Cayuse flights. 2ND BDE - Two battalions of the 5th North Vietnamese Regt lost at least 34 dead when they launched an abortive rocket, mortar and ground attack on the night location of the 1st Bn (Mech), 5th Inf. Standing firm behind a wall of artillery, gunship and tactical air support, the 25th Inf Div soldiers took nine wounded in the heavy fighting 15 kms northwest of Cu Chi. LTC Thomas C. Lodge of Deland, Fla., said ambush patrols set up around his unit's forward base also took a heavy toll on enemy attempting to join the battle, preventing any major ground assault on the defensive position. Although patrols and listening posts had earlier reported numerous sightings and movement, the action first began when enemy gunners unleashed a 100-round mortar barrage on the battalion base. 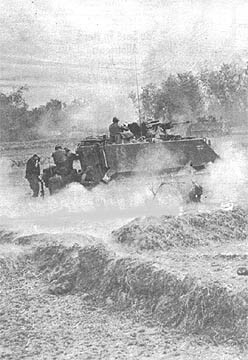 Following the midnight bombardment, North Vietnamese who had lined hedgerows surrounding the battalion's location began pouring RPG rocket fire at the U.S. troops, although none of the 40 recorded RPG's managed to score direct hits either on bunkers or tracked vehicles. When the first enemy assault came the 2nd Bde infantrymen opened fire with .50 caliber machine guns, automatic weapons, grenade launchers and mortars. Air Force AC-47 flareships illuminated the open rice paddies around the 5th Inf's position, making easy targets of the 10-man enemy assault groups. 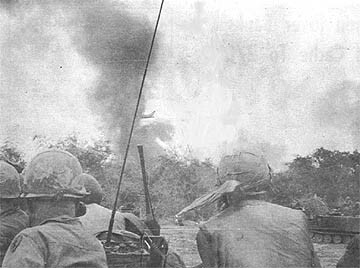 Gunships called in from the division base camp at Cu Chi encountered heavy anti-aircraft fire, but escaped damage during strafing runs over enemy positions. One "Bobcat" ambush patrol positioned near the forward base engaged an enemy company moving into the attack, killing with small arms, grenades, and mortar and gunship support at least 10 enemy and blocking the route to the beseiged Tropic Lightning battalion. Heavy fighting continued for more than an hour, then slacked off into sporadic exchanges of fire throughout the night. At daylight, 5th Inf units sweeping the battlefield found 34 dead enemy, plus heavy blood trails indicating more enemy had been badly wounded in the attack. The troops also captured eight RPG rocket launchers, one .30 caliber machine gun, six AK-47 assault rifles, 38 Chicom hand grenades and hundreds of pieces of web gear, gas masks and other equipment. WAITING IT OUT - An Air Force jet pulls away from the enemy trenchline it just bombed while troops of the 25th Inf Div's 1st Bn (Mech), 5th Inf, wait to assault the North Vietnamese held position 38 kms northwest of Saigon. The action occurred during an Operation Toan Thang reconnaissance in force mission. 1ST BDE - A two day battle with constant artillery support netted elements of the 25th Inf Div 17 dead enemy and 6 detainees during a heated battle in Operation Toan Thang 30 kms northwest of Saigon. Co's A and C of the 2nd Bn, 14th Inf, defeated the enemy while probing the banks of the Saigon River in the northern Filhol Plantation. The companies suspected trouble after Co C's lead man, PFC Samuel L. Brister of Durant, Okla., spotted enemy weapons and supplies near a tunnel entrance. The discovery was relayed to the rest of the men and a careful search of the area was made. "I called for 'Airborne' and he came around my side and walked up on three 'Charlies'," said Brister. "They were lying there resting and when they spotted me, one of them reached for his AK-47," recalled PFC David J. Galvond of Jonesboro, Ga., (nicknamed 'Airborne'). "I flipped my safety switch and aimed my M-79 grenade launcher at him. He moved his hand back and held his hands up like the other two," added Galvond. After the three detainees were evacuated, Co C came under heavy fire from enemy small arms as they continued their search. Artillery was called in on the enemy as the infantrymen of the "Golden Dragon" battalion continued their fight. By late afternoon the enemy had stopped firing and the Tropic Lightning troopers set up a night perimeter and kept a close watch on the area as artillery constantly struck the enemy positions. The next morning the soldiers of Co's A and C made on-line assaults against the battle-scarred area and detained three more enemy suspects as they took account of the numerous enemy losses. A total of 17 dead enemy, 6 detainees including one officer, one 12.7mm anti-aircraft Chinese Communist machine gun, one 75mm recoilless rifle, three light personnel machine guns and 10 AK-47 assault rifles were the result of the two day operation. In addition, 2 complete 60mm mortars, Chinese Communist carbines, and various small arms ammunition and supplies were captured. 1ST BDE - While on a reconnaissance in force operation 15 kms southeast of Cu Chi, the U.S. and ARVN 25th Inf Div's joined forces to kill 99 Viet Cong in two days of fierce fighting. When LTC A.S. Fullerton, Commander of the 4th Bn, 23rd Inf, received word that the 3rd Bn, 49th ARVN Regt was in contact with an estimated VC Bn, the "Tomahawks" responded immediately and moved to reinforce the ARVN force. The fire was so intense it was impossible to penetrate the enemy positions, and everyone pulled back while Fullerton directed a combination of artillery, mortars, gunships and air strikes upon the enemy positions. After three hours of pounding, the Tomahawk s again attempted to breech the enemy bunkers. But, they were well fortified bunkers and the enemy seemed unharmed and again opened up with an even heavier volume of automatic weapons fire. All the friendly forces again pulled back and more air strikes were called in. Late in the afternoon another daring assault was made on the enemy positions. With their armored personnel carriers deployed on line, the third platoon of Co B reached the enemy woodline where the blistering fire-fight continued. As darkness fell, the Tomahawks withdrew to within 200 meters of the woodline and set up a night defensive perimeter. Artillery, mortars and air strikes pounded the enemy base camp through the night to prevent his retreat under the cover of darkness. At dawn the 4th Bn, 23rd Inf, the 3rd Bn, 49th ARVN Regt and a troop from the 10th ARVN Cav deployed on line and assaulted the once impregnable woodline. Sporadic enemy fire cracked during the assault but was quickly silenced by the determined Tomahawks and ARVN's. The result of the fierce two day fire fight was 99 enemy killed and five more captured. The Tomahawks also captured 21 AK-47's, 10 Chicom Carbines, seven RPG-2 launchers, 10 RPG-2 rounds, 25 82mm mortars, numerous Chinese grenades and 34 complete North Vietnamese Army field packs. 3RD BDE - A Vietnamese woman inadvertently caught in a firefight earned her Combat Infantryman's Badge in the eyes of the men of the Recon Plt, 2nd Bn (Mech), 22nd Inf. "The old woman, who frequently sells soft drinks to the 3rd Bde, 25th Inf Div platoon as it sweeps the roads from Dau Tieng to Tay Ninh, was caught up in the firefight when a Viet Cong force opened up on the "Triple Deuce" sweep team with RPG rockets. 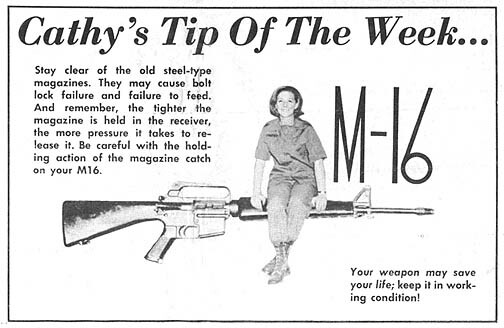 While the firefight raged, she gamely huddled on the side of the road behind one of the platoon's armored personnel carriers, reloading M-16 magazines as they were handed to her, then tossing them back to the troops. During the middle of the battle one G.I. jokingly asked whether he could buy a Coke. Looking up briefly from her magazines, the old woman coolly. responded, "No sweat, G.I., Cokes free today!" Deep down in your heart, you must have known it would happen sooner or later. Well. it finally has: You are going to be computerized! To be more precise, information contained in your personnel files maintained in the division Adjutant General Section will soon be fed into a computer called "UNIVAC 1005 Card Processor." The result, said LTC Clarence A. Riser, division AG, will be a faster, more accurate system of personnel accounting and management. According to the AG, the accuracy will result from the fact that fewer human beings will handle the data used to manage your personnel affairs. As have many other Army divisions in the states and in Europe, the 25th Inf Div will soon receive its first computer and will then begin operations under a new personnel management system called PERMACAP - Personnel Management and Accounting Card Processor. When PERMACAP begins, automatic typewriters, called Flexowriters, will be used to type division orders while simultaneously performating vital information into a paper tape. The paper tape will be fed into the UNIVAC 1005 computer which will automatically update a set of punch cards containing the data on all personnel assigned to the division. Information on the punch cards can then be called forth at any time it is required. Use of the paper tape eliminates many opportunities for errors to creep into your records and insures that your records will be up-dated quicker, said LTC Riser. At present it is necessary for clerks to extract vital data concerning MOS changes, promotions, proficiency pay changes and the like from orders and record it on morning reports. The same data is then extracted from morning reports and placed on punch cards. LTC Riser has stressed that the new system will not initially eliminate the need for preparing the morning report but will undoubtedly change its use. It will be used to verify accuracy of personnel data, he said, and will no longer be required above division headouarters level. In recent months, the Armed Forces have received a great deal of adverse publicity concerning the misuse of drugs by service personnel. The tragedy lies not in the publicity, but in the fact that within our ranks we have a few people who have so little regard for themselves and their responsibilities that they voluntarily subject themselves to the destructive effects of illicit drugs. Regardless of the fact that only a very small number of personnel in uniform abuse drugs, it is far too many. One serviceman abusing drugs is one too many. It doesn't matter which drug you are talking about - all of them have a great destructive potential when taken for "kicks" rather than at the direction of a trained physician and under medically prescribed conditions. You would certainly not entrust your life or safety to the irrational whims or reasoning of someone who is mentally ill. By the same token, you should not want to entrust your life and safety to a man whose judgement and responses have been dulled and deranged by the abuse of drugs of any type. The drug abuser is a menace to himself, his fellow servicemen and his country. He has no place in the military where the lives of others and the safety of our nation could be threatened by his irrational acts. He carries spare beaks and a monkey wrench. For added insurance, the tips are of steel. To any spot of uncovered hide. He dodges your blow then bores straight on in. He evades your punches as you continue to flail. Three quarters stinger and one quarter tail. Can you imagine one quarter tail and three quarter sting? At the size of an eagle, he'd conquer the earth. That's the time for his dinner and the peak of his bite. Make peace with your God, you surely can't win. Four hundred thousand enlisted men will be affected by the new insignia changes announced by the Department of the Army. By June 30, some 6,600 non-commissioned officers in pay grades E-5, E-6 and E-7 will change insignia. The NCOs are currently wearing insignia one grade higher than their actual grade. A private in the pay grade E-2 is now authorized one stripe, the insignia formerly of private first class. The private first class will wear one stripe above one arc. The changes in private E-2 and E-3 will also be completed by June 30. More than 146,000 privates in grade E-2 will get the stripe and 231,000 privates in grade E-3 will change insignia. The mandatory changeover for NCOs does not represent a reduction in grade. The individuals involved will continue in their present pay grade and retain those privileges and benefits of that grade. The changeover resolves a problem of dual insignia for grades E-5, E-6 and E-7 which has existed for 10 years. Now all NCOs will wear insignia that is actually representative of their grade. The problem of dual insignia began on June, 1958, when new insignia for E-5 through E-7 were authorized as part of the pay grade structure change that established pay grades E-8 and E-9. All NCOs were allowed to keep their stripes although they indicated a grade above their actual pay grade. New insignia for privates should be available within the month. 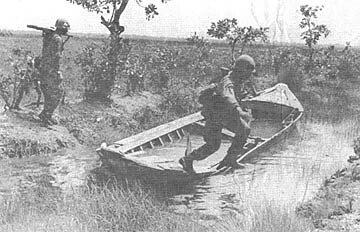 CROSSING - Members of Bravo Co, 3rd Bn, 22nd Inf, use an abandoned sampan to make a dry crossing in rice paddies as the 3rd Bde, 25th Inf Div, soldiers are on operation south of Cu Chi. With the advent of the monsoon season the importance of proper bunker design cannot be overstressed. Heavy rains increase the weight of sandbag roofs and undermines foundations and may collapse the bunker. A common error is to use only sandbags and filled ammo boxes to support overhead cov er. While these materials are suitable for wall revetments they should be used with timber or matting for adequate overhead protection. Moreover, when PSP or M8A1 matting is used it should be supported on 24" centers by adequate-sized timber in order to properly support sandbag roofs. Finally, timber supports should be checked periodically and replaced when necessary. All personnel in the grades of E-4 (with under four years service) and below who have dependents are required to support those dependents with a Class Q allotment. Members in grades E-4 (with over four years service) and higher are not required to provide support by allotment; but, when a member is promoted to E-5 or completes four years service as an E-4, his Class Q allotment will be terminated by the finance officer and a Class E allotment will be initiated in the same amount. This amount is subject to the service member's approval. If the member desires other arrangements he must report in person to his finance office to initiate the desire action. 1ST BDE - "Suddenly, a bright yellow hand emerged from the tunnel and three NVA soldiers came out looking like someone had sprayed yellow paint all over them," recalled 2LT Douglas Miller of Vancouver, Wash. The 25th Inf Div's 2nd Bn, 14th Inf, was on a reconnaissance in force mission 54 kms northwest of Saigon when a flankman spotted a body in a tunnel entrance. "I went down in the hole and saw two others move back in the tunnel," said PFC Damon Darley of Seattle, Wash. The Vietnamese interpreter with the unit told the enemy soldiers to come out and the American medic would treat their wounds, but they refused to answer. "Finally, when they wouldn't answer, and we could see they weren't going to come out on their own we decided to throw a yellow smoke grenade in the tunnel to see if it would drive them out," Miller said. They came out - slightly yellowed, but unharmed. What Is Joy? Being Alive! 1ST BDE - The 4th Bn (Mech), 23rd Inf, and a Trp from the 11th Cav substantially aided the beleaguered town of Boa Trai, 12 kms southeast of Cu Chi base camp, from being overrun while on a reconnaissance in force operation. It was by the direct support of the 25th Inf Div force that the besieged town was saved. 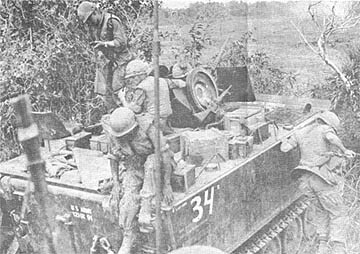 The 4th Bn, 23rd Inf Tomahawks were informed of the precarious condition of Bao Trai just after midnight, and were dispatched to relieve the pressure. By dawn, the Tomahawks were in contact with an estimated VC battalion. LTC A.S. Fullerton, CO of the Tomahawks, a firm believer in the use of fire support, directed Alpha and Bravo companies to pull back as he directed an artillery barrage and tactical air strikes onto the enemy positions. Then with Bravo on one flank and the 11th Cav Trp on the other, Alpha Co and the reconnaissance element spearheaded an assault. The advancing unit had moved only 20 meters into the woodline before the enemy opened up with a heavy volume of automatic weapons and RPG fire. The .50 caliber machine guns barking and elements dispersing on line between the armored personnel carriers, the determined Tomahawks overran the poorly dug in enemy. During the height of the fire fight, LTC Fullerton, flying over the battlefield by helicopter, noticed an enemy squad retreating into an adjoining woodline. Having swept over the first objective, the Tomahawks proceeded to the noted woodline. CPT Gordon R. Lam, Alpha Co CO, detained one VC for questioning and the company found 10 enemy bodies in the immediate area. A sweep of the entire battle area netted 35 enemy dead in addition to those already found. The day's work completed and the threat to Bao Trai eliminated, the Tomahawks moved on to other activity as a matter of course, but taking with them the knowledge of the safety of the village and remembering the relieved looks on the faces of the villagers. TAKING CAREFUL AIM, an infantryman of the 4th Bn, 23rd Inf, sights in on a Viet Cong bunker with a 90 mm recoilless rifle. INFANTRYMEN watch as a tactical air strike is directed on the enemy positions. CHARLIE GETS A TASTE of his own medicine as a Tomahawk fires an AK-47 during the action. TOMAHAWKS scramble off an APC as they receive sniper fire. 1ST BDE - Heliborning into the banks of the Saigon River netted elements of the 25th Inf Div a large number of enemy weapons during Operation Toan Thang. Two Chinese communist 75mm recoilless rifles, one Chinese communist anti-aircraft machine gun, 13 Chinese communist light personnel machine guns and 20 AK-47 assault rifles, highlighted the cache uncovered 20 kms northwest of Saigon. Co D, 2nd Bn, 14th Inf, found the weapons at the edge of a canal while conducting a reconnaisance in force mission in the northern Filhol Plantation. "Our platoon was walking point for the company and had only been sweeping about an hour when my lead man came upon the weapons," said 3rd platoon leader 1LT Michael C. Long of Mackeyville, Pa.
"I spotted some of the machine gun barrels facing toward me near some trees. At first I figured we were surrounded by 'Charlie'," remarked PFC Gerald W. Smith of Hesperia, Mich. "I kept a close eye on the protruding barrels and called for Huber." Long contacted the commanding officer of Co D, CPT Raymond C. Dawson of Muskogees, Okla., and the Tropic Lightning soldiers set up security and the cache was checked out. By the time the choppers arrived for evacuation of the weapons, another anti-aircraft barrel, 2 RPG-2 rocket launchers with rounds, 1 complete 82mm mortar with 4 rounds, 75 pounds of demolition explosives, 5 anti-tank mines and other enemy supplies were also uncovered by the Golden Dragons. After evacuation of the weapons, the men of Delta Company airlifted back to their fire support base. "That's a few more weapons we won't have to worry about facing," concluded SGT Clyde N. Mackins of Palaski, Ill.
2ND BDE - Elements of a 25th Inf Div recon platoon, surrounded by enemy while its parent battalion was under heavy attack, successfully blocked a North Vietnamese column of reinforcements from entering the battle. SSG Leonard Charfacuros, 22, of Agana, Guam, said his ambush patrol killed at least 10 North Vietnamese who were on their way to attack the base camp at Cu Chi. Charfacuros said his recon platoon had positioned itself around a rice paddy a kilometer from the 5th Inf's night location 15 kms from the division's base camp at Cu Chi. Shortly after midnight, two battalions of the 5th NVA Regt began pounding the U.S. battalion with a 150 round barrage of RPG rocket and mortar fire. The enemy followed up the bombardment with repeated ground attacks. Soon after the battle began, the ambush patrol spotted a heavily armed enemy company moving towards the U.S. perimeter. Charfacuros ordered his men to open fire with grenade launchers and hand grenades, but forbade the use of rifles and machine guns to prevent a compromise of the platoon's positions. Hit "hard and confused," the enemy unit first scattered, then began filtering in small groups by the recon platoon's perimeter. At daybreak, Charfacuros led his platoon on a search of the area, finding ten bodies and detaining one enemy suspect who attempted to escape. As a result of the patrol's action, at least 10 North Vietnamese were killed and two detained, although blood trails indicated more had been hurt in the ambush. CU CHI - Since resuming field operations after a pause during the February Tet offensive, the 25th Inf Div Artillery Civil Affairs Section is again rolling in high gear. As part of a continuing medical civilian aid program (MEDCAP), medical teams from the 6th Bn, 77th Arty and 3rd Bn, 13th Arty, and Headquarters Battery, treated more than 2,000 men, women, and children in Trang Bang District in March and April. To combat the deadly menace of plague, the teams administered some 830 immunizations thereby helping to avert a possible epidemic. When transportation was disrupted during Tet and procuring enough food became a problem for the residents of Trang Bang District, Division Artillery Civil Affairs Section turned over to district authorities 400 pounds of rice and 200 pounds of fish which had been captured from the Viet Cong. hey also provided 210 loaves of bread as well as dried potatoes, onions and eggs. To help the Regional Forces and Popular Forces strengthen their installations, the Civil Affairs Section delivered over 3,000 powder canisters to be utilized as bunker reinforcement or even as pipe line when welded together. Thirteen 21/2-ton truck loads of lumber were given to the Trang Bang District Chief to be distributed to the Vietnamese. Over 100 bags of cement, 120 tin roofing sheets, 325 coils of concertina wire, and 100 rolls of barbed wire were also presented. A donation warmly welcomed by mothers of the district was 160 pounds of soap and 48 bottles of baby oil. The battalion commander was speaking to his men: "The pulling together, the reliance of men upon one another, the 'camaraderie' of soldiers in war is unique among men. I've seen it on this operation and I'm proud of it." The commander has noticed "it." Have you? This comradeship of soldiers in combat is a model that the rest of the world might favorably duplicate. Circumstances of warfare thrust aside differences which don't really matter. "How is he, sir? Will he be o.k.?" A worried soldier, with badly injured legs, lay on a stretcher in a combat aid station. He anxiously looked over to another stretcher. His great concern was not for himself, but for a wounded buddy with different colored skin. "Greater love than this, no man has, that he lay down his life for his friend." Many a silver star for valor has been awarded posthumously to soldiers who died trying to rescue a wounded soldier of another race, or nationality, or religion. Good is where you find it. Call it 'camaraderie' or friendship, call it understanding or brotherly love, many soldiers have found "it" in Vietnam. If you have been one of them, then for love of God and country, don't leave it behind when you 'DEROS'. Bring it home. Live it. Our country needs it now. (By Chaplain (Cpt) Thomas R. Berberich). 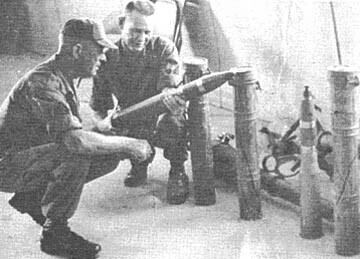 75 RECOILLESS CARTRIDGE - CSGM John Schafer of Hilleen, Texas (left), and SFC Robert Cooley of Opelika, Ala., examine one of the 75mm Chinese Communist cartridges found in a large weapon cache by the 2nd Bn, 14th Inf, 60 kms northwest of Saigon. 2ND BDE - Elements of the 1st Bn (Mech), 5th Inf, returning from a reconnaissance in force aided members of a Regional Force unit in successfully hunting down an enemy assassination team. Co A and the battalion headquarters were on the way back to their night location when they heard small arms fire to their south. LTC Thomas C. Lodge, Deland, Fla., wheeled his battalion towards the fighting, soon encountering a squad of the 198th Regional Force Co. Through the company's interpreter, Lodge learned the squad was chasing three Viet Cong who had seriously wounded the village chief of Vinh Loc, Gia Dinh Province, six kms northwest of Saigon. Lodge then told the RF soldiers to hop on board his armored personnel carrier, and with the Vietnamese pointing the way, continued the chase. The combined force nabbed the first enemy in a wooded area. The man had changed clothes, but the outfit he wore on the murder attempt was still in his possession. The 25th Inf Div soldiers detained the second would-be assassin when he attempted to escape via his motorcycle. The RF squad leader spotted the man, shouted for him to halt and then shot at him when the man fled on foot into some roadside brush. SP4 Dan Oberding, 20, of Seneca, Kan., a radio-telephone operator with the 2nd Bde battalion, jumped off the command track and sprinted after the Viet Cong. The 6-foot 2-inch tall Oberding caught the man after a brief, one-sided foot race. Further to the southeast, elements of Co A, 2nd Bn, 34th Armor, detained the third member of the assassination party. When all three were returned to Vinh Loc, villagers and ARVN intelligence officers identified them as the killer team. In addition, the man who attempted to mount the motorcycle was identified as the executive officer of a local Viet Cong rifle company. 3RD BDE - Most people think of a towel as a good way to dry off after a refreshing shower. To the men of the 3rd Bn, 22nd Inf however, the O.D. towel is a valuable piece of field equipment with as many uses as the trusty poncho. Worn draped over the shoulders, the towel provides excellent padding for their pack straps. On dusty convoys the 3rd Bde, 25th Inf Div troopers utilize their towels as small arms cases that can be removed quickly in case of attack. As a "foreign legion" type headdress, the green towel provides protection from insects and the elements. Waiting for the right sortie on a landing zone is a lot more comfortable with a handy towel to protect the face and neck from dust whirlpools caused by the powerful Huey rotor blades. When folded into a small square it becomes a soft pillow. The men of the 3rd Bn, 22nd Inf also use their towels to dry off after washing up, but even then the "Regulars" try not to get them too wet since the O.D. towel is also useful when it's dry. GRANDMA? COUSIN? BROTHER? What kind of bird is that? 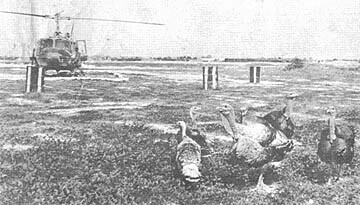 Turkeys that roam freely around the 25th Inf's 1st Bde headquarters at Tay Ninh, curiously wonder about the questionable heredity of their mechanical counterpart. The turkeys were given to the 1st Bde by the Tay Ninh province chief. No one can say enough about the vital necessity of a professional, expedient medical facility in this unpredictable conflict. The men who pit their all explicitly towards the health and safety of our fighting soldiers in Vietnam deserve every ounce of credit one can bestow. For they are the ones who assure the soldier in the field that he is the most important asset the Army has: manpower. The 25th Med Bn is made up of such men. Constituted into the Army of the United States on August 26, 1941, it was assigned as a Tropic Lightning unit. The unit was actuated at Schofield Barracks in Hawaii in October first, 1941. 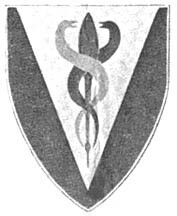 The 25th Med has a long and honorable history. As an organic element of the 25th Inf Div, it served in the South Pacific during World War II, gaining for itself the Philippine Presidential Unit Citation. The battalion was awarded four campaign streamers for its participation in fighting on Guadalcanal, the Northern Solomons, Central Pacific, and Luzon. On June 27, 1949, the battalion was designated a Regular Army unit, and when fighting broke out in Asia on June 25, 1950, the Med Bn moved to Korea with the Tropic Lightning Div. It participated in the battles around the Pusan Perimeter, Punchbowl, Heartbreak Ridge, Kumhwa, and Munsan-Ni. The battalion was awarded another ten campaign streamers for battle participation in the Korean conflict, two Republic of Korea Presidential Unit Citations, and the Meritorious Unit Commendation. 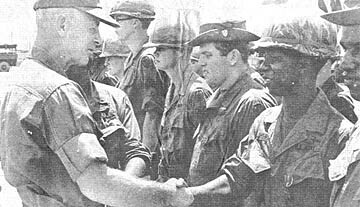 The first elements of the battalion arrived in Vietnam in January, 1966. By March 31, 1966 the entire battalion had been transferred to Vietnam. To date, elements of the unit are credited with participation in operation Wahiawa, Makiki, Kahana II, Oahu Blue Jay. Junction City, and Yellowstone, in addition to other unnamed operations. On top of all this it conducts an aggressive Civic Actions program. Companies of the unit are presently located in Cu Chi, Dau Tieng, and Tay Ninh. LTC Rainer S. Pakusch, Bn Co., heads a unit that can be proud of its record and its job. 2ND BDE - Two officers were among five North Vietnamese Army (NVA) troops who walked into a recent 25th Inf Div ambush 15 kms northwest of Saigon. Members of Co C, 2nd Bn, 27th Inf "Wolfhounds", reported killing the five enemy after setting up at an enemy rendezvous point. 2LT David C. Rodgers, the platoon leader, said his men moved into the ambush site along a canal bank after waiting for darkness during an Operation Toan Thang reconnaissance in force. Around 10 p.m. explained Rodgers, 22, of West Point, Ga., his men saw a sampan land downstream and three persons disembark. The trio walked along the canal bank until they stopped in front of a Claymore mine. SP4 Ernest L. Jackson watched one of the enemy light a cigarette. Jackson, 23, of Coleman, Tex., ordered his squad to detonate the claymore, killing all three. Six hours later, the platoon engaged with automatic weapons and grenades a pair of enemy who walked by the ambush site. A sweep the next morning revealed the five North Vietnamese and six automatic weapons. Identification papers indicated two of the men had been NVA officers, Rodgers said. 1ST BDE - Three 25th Inf Div soldiers who by day staff the 1st Bde's S-5 section, teamed up at night to neutralize an enemy rocket position. Voluntarily moonlighting as forward observers (FO's) atop a 147 foot tower in nearby Gao Xa village, SSG John Gilber of Quincy, Fla., and SP4 Richard Kreutzberg, of Yonkers, N.Y., worked with their Civic Action officer CPT F. L. Fly who was on duty at the Tactical Operations Center in Tay Ninh base camp. 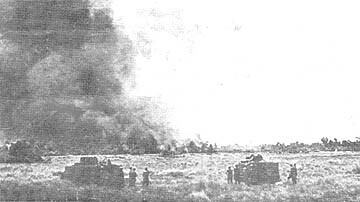 The team called in artillery fire moments after the first rocket was launched but before any damage or casualties were taken. 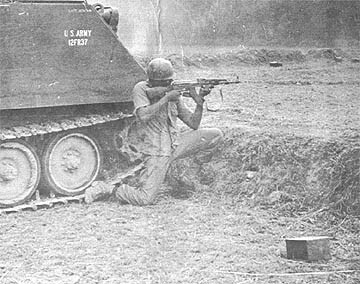 The incident occurred when an ARVN interpreter working with the 1st Bde soldiers spotted a 122mm rocket being launched by the VC. He identified the position and Kreutzberg called in the location to Fly, a native of Nashville, Tenn. Seconds later Gilbert and the interpreter spotted three more rockets being launched, two of them from another position. As the rockets slammed into the base camp, Kreutzberg was again in contact with Fly, giving him the position of the other launch site. As the Civic Affairs officer was calling in artillery to hit the position, Gilbert manned a .50 caliber machine gun mounted on the tower. Although one of the launch sites was 1,500 meters away, Gilbert, who was assisted by a Kit Carson scout, Dau Van Ut, was on target. Moments later the FO team watched artillery pound the area. "You can bet the VC were planning to send in more rockets," said Kreutzberg later. "But either we hurt him or scared him off, because Charlie didn't launch any more after we hit his site." According to Fly, a leader of Cao Xa village requested that American troops equipped with a radio be placed in the tower as a counter mortar and rocket team. Realizing that from the tower one can detect rocket and mortar flashes for miles around, Fly asked his section for volunteers. Everyone volunteered. Fly, SSG Donald Haynes, another Civic Action NCO, Kreutzberg and Gilbert have all stood watch on the tower. Summing up how he feels about the team's continuing vigil, Gilbert said, "I just sleep better knowing that our men are up there. And Father Dzu tells me that his people of Cao Xa feel the same way." 1ST BDE - The 25th Inf Div's 4th Bn, 9th Inf, killed 23 Viet Cong with the aid of artillery and airstrikes, nine miles northwest of Saigon. Co A made an airmobile assault, and as they jumped from their choppers on the landing zone the Manchu infantrymen were greeted by a hail of heavy automatic weapons fire. Using the tremendous firepower at his disposal, CPT Elcie Adams called in artillery and airstrikes upon the enemy positions. When the artillery lifted the Manchus quickly pushed into the woodline. The Viet Cong were in well-fortified bunkers and still putting up strong resistance. SP4 Robert Tafoya of the 2nd Pit, firing his 90mm recoilless rifle, blew apart several VC bunkers, killing three enemy. Raking the area with machine gun fire the Manchus killed several more VC as they fled their bunkers. Encountering no more resistance, the Co A soldiers swept the area and found 23 dead VC, 4 AK-47s, 1 Chicom carbine, 2 sights for the 122mm rocket, and 500 rounds of AK-47 ammunition. 1ST BDE - Someone once said, "Third time's charmed." And 1LT John R. Smith, a 25th Inf Div artillery forward observer (FO), now believes it. Smith, an FO with Co C, 2nd Bn, 14th Inf, and the battalion commander, LTC Thomas Nunn, were in an OH-23 light observation helicopter over the Filhol Plantation 32 kms northwest of Saigon when they received a radio message telling them that "Charlie" was firing 122mm rockets at the 25th Div's Cu Chi base camp. "Just as we received the message, our pilot pointed out the flash from the rockets as they headed for Cu Chi," Nunn recalled. "I hadn't been in country very long, but the terrain features gave me a good idea of the location so I did my best. The first couple of rounds made the VC scatter as we flew lower to take a closer look, but boy that third one really did the trick," said Smith of Bakersfield, Calif.
"The third one was the charm all right. I'll guarantee you that 'Charlie' got the surprise of his life and that was the last of his rocket activities," added Nunn of Henryetta, Okla.
Quick action by the trio put a halt to the early evening rockets as the rocket site went up in flames when the third shell from the big guns made a direct hit and set off a secondary explosion. 3RD BDE - Using a Huey as transportation, a medical team from the 3rd Bn, 22nd Inf of the 3rd Bde, 25th Inf Div, flew into Tay Ninh Province for a MEDCAP. Under the direction of the battalion surgeon, CPT Ira P. Mersack, the "Regulars" medics treated over 300 patients in the hamlet of Suoi Can during the afternoon project. This turnout was the largest yet for a medcap in this heavily populated district, where the previous week had seen only half as many villagers attend the afternoon clinic. "We will be coming to one of the hamlets in this district every week," commented Mersack; "eventually we hope to establish a tuberculosis clinic and an immunization clinic here." 1ST BDE - MG F.K. Mearns, 25th Inf Div CG, recently visited the 4th Bn (Mech), 23rd Inf "Tomahawks" here, to decorate members of the battalion. With old glory and the battalion colors waving in the breeze and the Tomahawks locked in the position of attention, GEN Mearns arrived at the presentation ceremony. Walking through the ranks, he decorated several men for valor and to each one extended a sincere hand of congratulations. With the presentations completed, the Commanding General addressed the decorated men. In part, he pointed out his pride in them and his desire to decorate them all with the Medal of Honor, as they were probably deserving of this high tribute. He also remarked that he would like to decorate each and every Tomahawk and finally extended to each soldier a sincere commendation on a job well done. CONGRATULATIONS! - MG F.K. Mearns, 25th Inf Div Commander, congratulates Tomahawk SP4 Elmo Overton of Norfolk, Va., after presenting him with the Bronze Star for Valor. 1ST BDE - In order to be on target, artillery units must place accurate data on their guns. One of the factors that must be taken into consideration when computing firing data is the prevailing weather conditions. Because a significant change in air density, wind direction, or wind velocity can result in a firing error if not accounted for, artillery units at Tay Ninh base camp greatly depend upon the weathermen of the Meteorological Observation (METRO) station. At Tay Ninh, the team of men who staff METRO work around the clock keeping a constant surveillance on changing weather conditions. The II Field Force unit is commanded by WO Harold J. McLaughlin, Jr., of Escanaba, Mich. 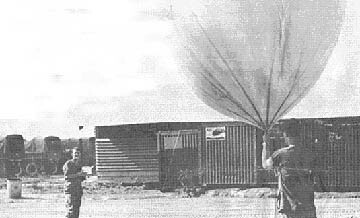 The method of gathering meteorological information was explained by SSG Thomas R. Murdock of Fairfield, Calif., "We periodically send u p weather balloons with a radiosonde (battery operated transmitter) attached to it. As the balloon begins its upward flight, the transmitter then begins relaying information to the METRO station. Also, as the balloon ascends it is followed by an automatic tracking device." The reports sent back to the station are then broken down into two groups. Computer data is sent to the Air Force weather station. Ballistic data, such as temperature, density, wind direction, and wind velocity is then checked, charted, and immediately forwarded to artillery fire direction centers. READY FOR LAUNCHING - Member of METRO (Meteorological Observation) are ready to release a weather balloon with its transmitter, on its "weather data" collecting flight. 2ND BDE - A reinforced mechanized company of the 25th Inf Div fought through thick terrain and overran a North Vietnamese battalion-size base camp, killing at least seven enemy and capturing their weapons. Co B, 1st Bn, 5th Inf, then called in demolition experts to destroy 46 reinforced bunkers and nine fighting positions in the enemy installation 11 kms northwest of the 25th Div's base camp at Cu Chi. The Tropic Lightning troopers made contact around mid-morning while pushing through dense underbrush and trees on the edge of the HoBo Woods. A heavy prep of artillery, tactical air strikes and mortar fire failed to drive the North Vietnamese completely from the camp. As Co B moved in, heavy AK-47 fire erupted from several fighting positions. Armored personnel carriers crashed through the brush and blasted fire lanes for the dismounted "Bobcat" troopers. The ground soldiers then advanced, pouring anti-tank rockets and automatic weapons fire on the enemy bunkers. By noon, the North Vietnamese force deserted its complex, leaving behind seven dead and four AK-47 assault rifles, an RPG-2 rocket launcher and a collection of medicine, web gear and personal equipment. Inside the complex, the Operation Toan Thang infantrymen found several incomplete bunkers, new NVA uniforms and building equipment. Rice was still warm in several cooking pots. Battalion demolition men used plastic explosives to demolish the North Vietnamese complex. There were no U.S. casualties reported in the fighting. Current regulations of all services prohibit the display of any flag, pennant or emblem on official vehicles or for official purposes unless specifically authorized by AR 840-10. Individuals may have in their possession state flags, personal flags, pennants or emblems etc. for their own personal use only. Display of state flags, pennants or emblems etc. on U.S. Army vehicles of any type, or outside U.S. Army buildings is considered official in purpose and therefore not authorized.